The Bakken rig count gained one to settle at 180 running in the region this past week. This marks a turn from small declines over the past five weeks. The U.S. rig count is down 4 to 1,778, of which 182 are running in the Williston Basin. A total of 386 rigs are targeting natural gas and 1,385 are targeting oil in the U.S. The remainder are drilling service wells (e.g. disposal wells, injection wells, etc.). The week was full of earnings reports from the second quarter, but was highlighted by promising well results from Continental Resources. The company now believes the Lower Three Forks is prospective across a 3,800 square mile area in the Williston Basin. Outside of areas with significant natural fracturing, more wells will be required to maximize recoveries. Note: The NDIC reports 183 rigs are active in North Dakota. That is 12 more than Baker Hughes reports. The difference is likely accounted for in the number of rigs actually working. On any given week, a certain number of rigs are in route to the next well location or idle waiting to drill the next well. Those rigs are not counted in the Baker Hughes census. The number of oil rigs running increased by one to 180 in the region. WTI prices were trading just below $107/bbl on Friday afternoon and the benchmark has been above $100 for five weeks running. Williston Basin Sweet crude traded at $93.69/bbl on August 9th. The natural gas rig count in the region held flat at zero. Natural gas futures (Henry Hub) were trading near $3.20/mmbtu on Friday afternoon. That's more than $1 off the highs experienced in late spring. Approximately 10% of the production stream from the Bakken and Three Forks is natural gas and associated NGLs. 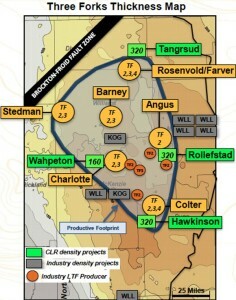 McKenzie County led development with 66 rigs running. Dunn, Mountrail, and Williams counties are the only other counties with more than 19 rigs running. View the full list below.